Understanding word families is an important step in learning to read. Being familiar with word families helps students identify rhyming words and create rhymes of their own. 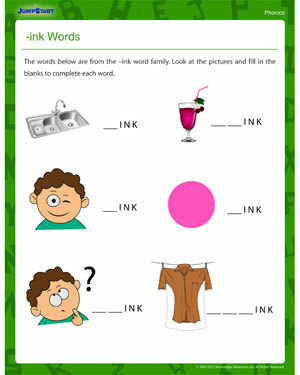 Help your first grader master this fun part of phonics with our free and printable phonics worksheet, ‘INK Words’. All the images in the worksheet are of INK words. Students must identify the images and then complete their names by filling in the blank spaces.